Decades have passed since air conditioning was a luxury only for the wealthy few. Nowadays aircon systems are almost taken for granted in all new-build developments and refurbishment projects. Air conditioning is essential for efficiency at work and as a means of keeping customers comfortable in hot weather. It guarantees a better quality of life at home and also ensures an adequate exchange of air in public buildings like hospitals, nursing homes, factories and offices. Various items of equipment can be involved in the air conditioning process, including dehumidifiers, purifiers, air conditioners and climate control systems. Air conditioners provide a basic solution for cooling hot environments but do nothing other than cool the air. Climate control systems, on the other hand, recycle and filter the air, purify it and can either cool or heat it, depending on outdoor temperature. When it comes down to technology, a lot depends on the size of the environment to be conditioned: users can choose either fixed or mobile systems, unit or split systems, ducted or convection systems. It is important to refer installation to expert technicians not only to avoid choosing the wrong type of system but also because a recognised qualification may be required by law to install these systems. 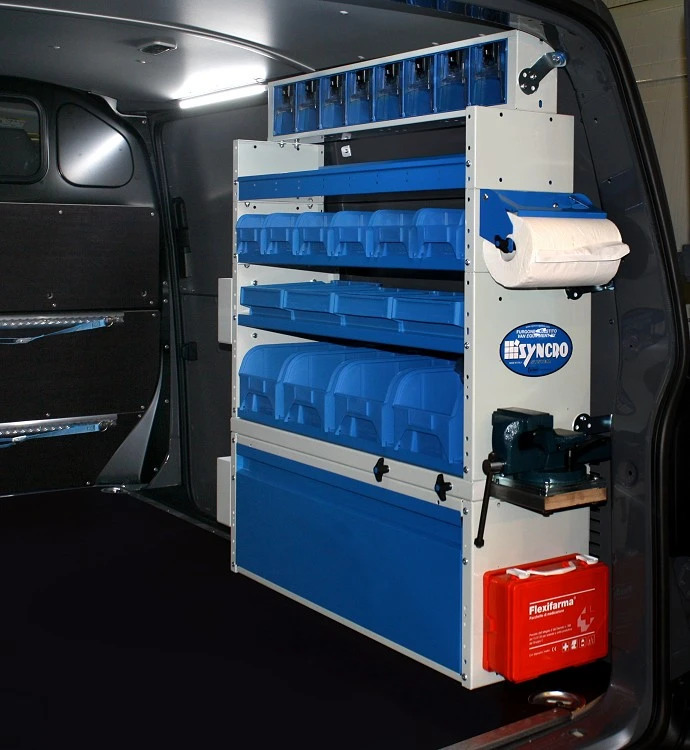 Technicians who install aircon systems need a van to get around and also require a suitable racking system for the job. The small van in the photos above is used as a mobile workshop by heating and air conditioning engineers. 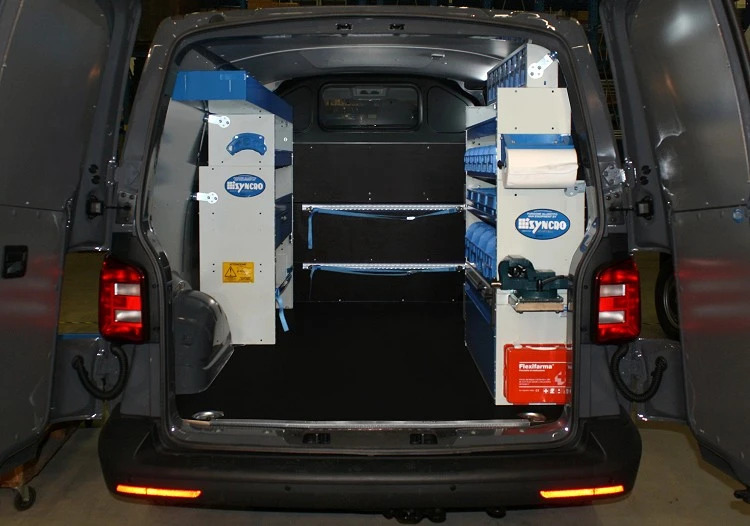 The vehicle was fitted out by Syncro System’s specialist installers in two phases. The first stage was the installation of interior body linings to reinforce the structure and to provide a flat surface for supporting the base cabinets and other accessories. Once the linings and floor were in place, the Syncro team set about fitting the racking and storage modules requested by the customer for his work installing, commissioning, and servicing domestic, commercial and industrial air conditioning systems. The floor was reinforced with a panel of resinated plywood with a non-slip surface. The same material was also used to line the bulkhead. The other surfaces – the walls, the insides of the doors and even the roof – were lined with panels in a special plastic material. The storage installed on the left side of the load compartment consists of a tool case cabinet with a hook and strap lashing system and two shelves. 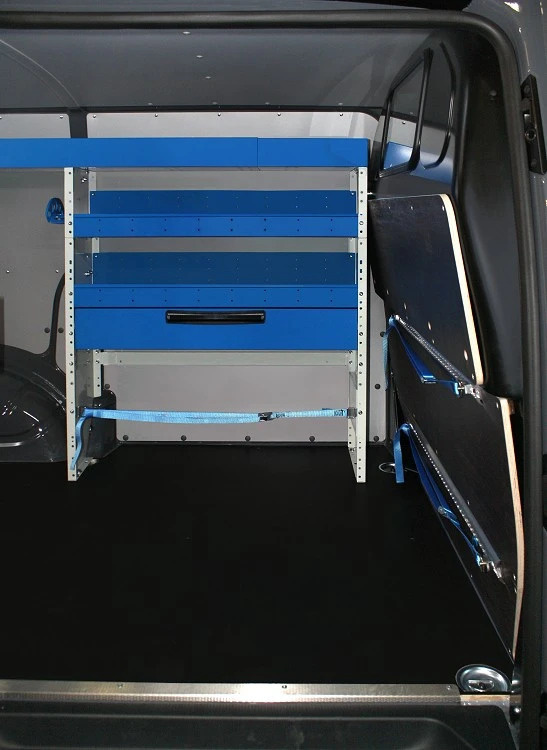 At the top, partly supported by the cabinet and partly secured to the wall of the van, a tray permits long items to be carried and removed from the end at the rear doors. The storage units on the right of the van are supported by a wheel arch cabinet that can be closed by a door. Three of the four shelves are fitted with frames for carrying removable plastic containers while the open top shelf is fitted with metal dividers and anti-slip mats. 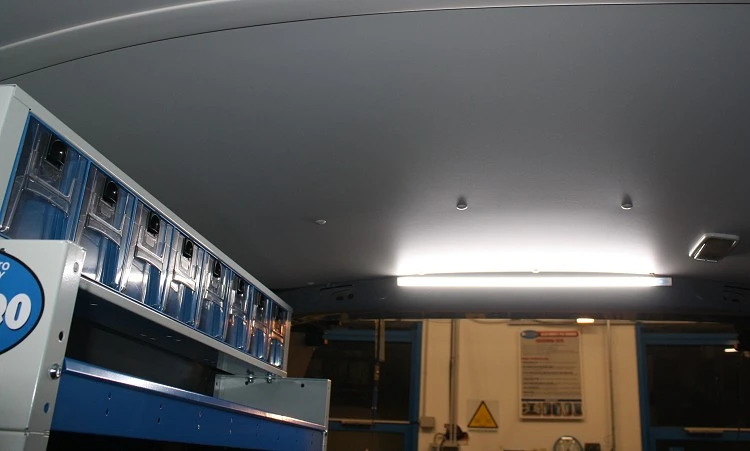 The area under the van roof has been used to install a Multibox unit with transparent drawers. The bulkhead between the load compartment and the cab is fitted with two metal rail and strap lashing systems. One of the key accessories in this van for air conditioning technicians is a vice with pull-out support, installed at the back of the right side cabinets. The other accessories that maximise the functionality of the vehicle are: a first aid kit, a paper roll holder (an essential addition to all vans), a cable holder and an LED light installed at the side door to improve the van’s otherwise basic interior lighting. 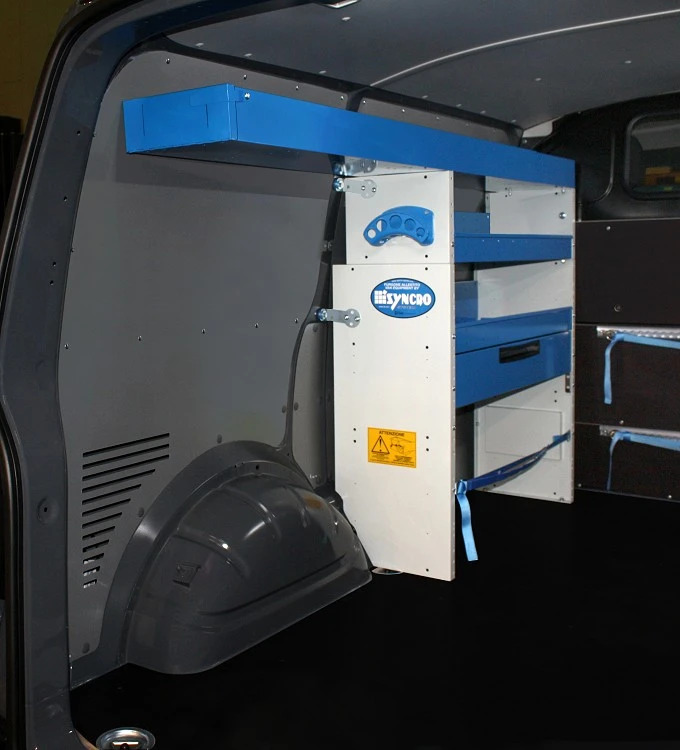 As with all Syncro System racking, the units and accessories installed in this van for domestic and industrial heating and air conditioning technicians are covered by Syncro’s warranty, fitted by expert installers and easy to remove without damaging the vehicle. Ask for a no-obligation quote at your nearest Syncro installation centre!